Red-throated Pipit (Anthus cervinus) nests in northern Europe and Asia and is found in northern Alaska. It is a far migrant that winters in Africa, South and Southeast Asia and along the U.S. west coast. The tawny pipit (Anthus campestris) breeds in much of temperate Europe and Asia, and northwest Africa. It is a migrant moving in winter to tropical Africa and the Indian subcontinent. TAGS: Bird painting of Tawny pipit, bird sketch of Tawny pipit, bird drawing of Tawny pipit, bird art of Tawny pipit, bird illustration of Tawny pipit. The water pipit (Anthus spinoletta) breeds in the mountains of southern Europe and southern temperate Asia across to China. TAGS: Bird painting of Water pipit, bird sketch of Water pipit, bird drawing of Water pipit, bird art of Water pipit, bird illustration of Water pipit. The Richard's pipit (Anthus richardi) is a medium-sized passerine bird which breeds in open grasslands in northern Asia. It is a long-distance migrant moving to open lowlands in the Indian Subcontinent and Southeast Asia. It is a rare but regular vagrant to western Europe. TAGS: Bird painting of Richard's pipit, bird sketch of Richard's pipit, bird drawing of Richard's pipit, bird art of Richard's pipit, bird illustration of Richard's pipit. The citrine wagtail or yellow-headed wagtail (Motacilla citreola) breeds in north central Asia in wet meadows and tundra. It migrates in winter to south Asia, often to highland areas. The Rock Pipit (Anthus petrosus) is endemic to Europe and nests on the rocky coasts of the Kola peninsula and in western Europe northwards from Brittany. It is normally a resident bird in Ireland, Britain and France, but the populations in Scandinavia, the Baltics and Russia moves south in winter, probably to the coastal areas of Western Europe. Half the world population of rock pipits are in Norway. The Grey Wagtail (Motacilla cinerea) breeds in much of the temperate regions of Europe and Asia and parts of northern Africa. . 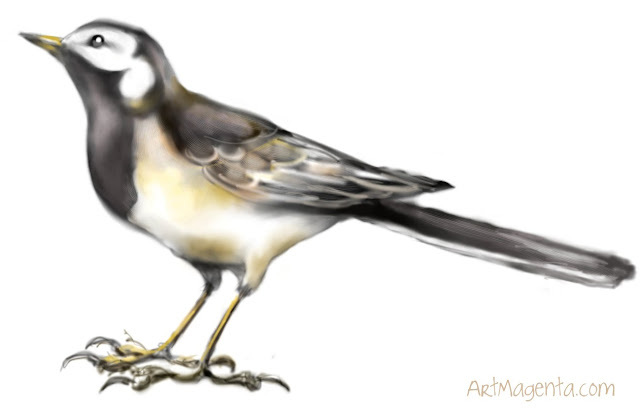 The White Wagtail (Motacilla alba) breeds in Europe and Asia and parts of north Africa. It is resident in the mildest parts of its range, but otherwise migrates to Africa. The Yellow Wagtail (Motacilla flava) nests in most of the temperate parts of Europe and Asia but there is also a small population in Alaska.